Five Sugars - PU New! Beach Cruiser - soft New! Flounder Pounder - soft New! Slip In - CV New! Double Wide - XB New! Love Child - XB New! The Boss - XB New! Due Back - MX New! SIXTY FORTY - MX New! 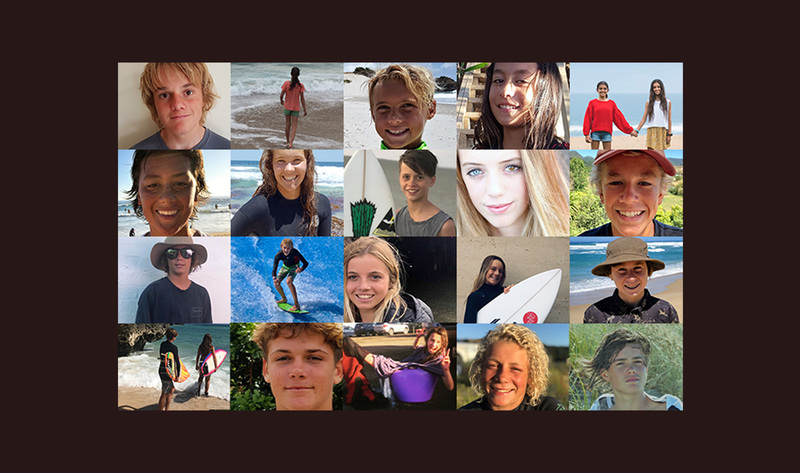 After receiving so many applications from some amazing kids the Australian & New Zealand round of the 2019 GSI Life is Better When You Surf® scholarships have been awarded. The qualifying recipients showcased the positive values of education, actively contributing to their community and a love of surfing that aligns with GSI’s mantra, Life Is Better When You Surf®. Congratulations to all recipients and a big thank you to all applicants. Find out more about our Scholarship program here. GSI has teamed up with Vlogger Benon Koebsch on his Wave a Day Project. Benon is going to catch a wave a day and video each session surfing his way through our range of boards, as his skill improves we will change up his board to suit. You can subscribe to Benon's youTube chanel to watch the daily wave here. Click below to find our more about the project. After 1,000's of enquires we reached out to Thomas Meyerhoffer to develop an updated mini quiver and after a few months of design and production, we are falling over ourselves with excitement as we annouce that Meyerhoffer 3.0 has arrived! The Meyehoffer range, first introduced in 2010 (years before it's time), is dedicated to Surfers with an open mind and a love of design. The latest range, built in Carbon Vector construction, is currently available in Australia and the US ONLINE ONLY through our web store. We are stoked to welcome Tom Carroll to the GSI Product Development Team. He brings a wealth of knowledge, a deep respect for the ocean and the fire of a surf-mad grommet! TC's first task was to join the crew on the 7S Hook photo shoot. Click below to watch his video review. 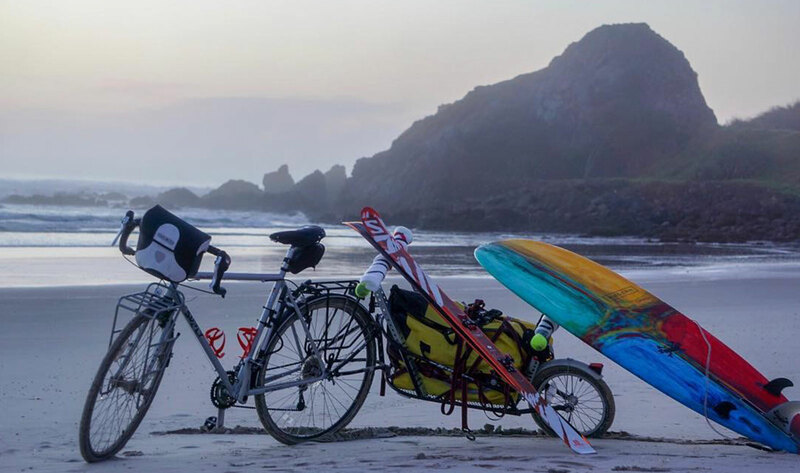 After being awarded Kyle Dempster Solo Adventure Award earlier this year Anthony Marra left his cosy job in Salt Lake City, Utah in September for a four month solo adventure, cycling, climbing, skiing and surfing his way around beautiful New Zealand. Travelling with a partially custom made rig along with all of his climbing gear Anthony has a Modern Love Child on board for when he hits the coast. GSI: What is the background to this NZ adventure, what made you apply for the Kyle Dempster Solo Adventure Award? AM: Kyle was/is an inspiration for me. His outlook on adventure and life has really motivated me to pursue my own dreams. Kyle was a local Salt Lake City climber with a vision for incredible human powered adventures, off the beaten path travel and big alpine climbs. On one particular trip, he filmed himself through Kyrgyzstan solo via bicycle to make first ascents on some massive peaks in the region. While the adventure morphed from his original plan, the lessons and story of the journey inspired me to bike solo from Canada to Mexico while climbing and skiing the major summits on the west coast of the United States. When the Kyle Dempster Solo Adventure Award was announced, I applied immediately. I wanted to do something that encompassed ridiculousness, human powered & sustainable travel, and something that embodied Kyle’s spirit of adventure... 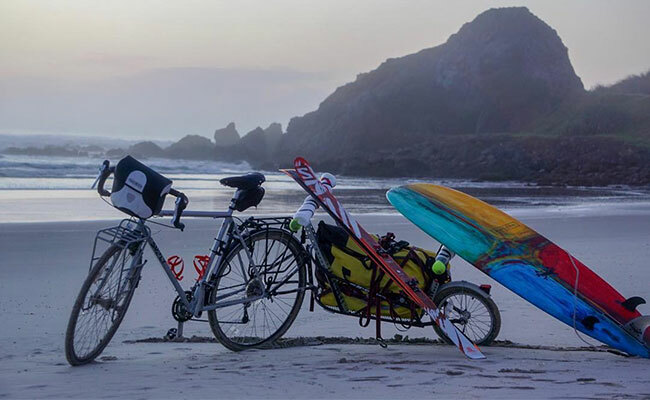 I knew I could carry my ski and alpine gear on a bicycle so the surfboard was the most logical step. NZ is one of those rare places where you can ‘easily’ combine biking, surfing, skiing and climbing in one massive trip. GSI: How long is your NZ trip and what route are you taking? GSI: Was your rig custom built? AM: Partially. The trailer is a BOB YAK, but the surf and ski carry I built myself. It was a challenge to figure out the build and it took me several tries. I was happy to finally build something that could fit everything. GSI: How much equipment have you got with you? GSI: Have you done much surfing yet? What surf breaks do you plan on visiting? AM: I have! I decided to bike from Auckland to Cape Reinga via the east coast because people were raving about the surf there. I surfed Te Arai, Mangawhai, and Waipu. On the way down from Cape Reinga I have only been to Shipwreck Bay so far. I plan to visit Raglan, Taranaki surf hwy, Wellington and loads more breaks on the South Island. I’ve only had one really great day in the water so far.... it’s difficult to hit the timing right when traveling by bicycle, but it makes those good days incredibly memorable. GSI: How did you end up with a Modern Love Child on your rig? AM: I went to a local surf shop in Auckland to pick out a board.... not being local and also a beginner/intermediate surfer I was having a difficult time choosing a board. Since I’m carrying so much weight and gear I needed to balance board length, width, and weight with my skill level and the variable conditions I’d be encountering. A local recommended three options, we both decided the 6’4” love child was a perfect fit. A ton of surfers I’ve met have all said that I chose the right board. I’m stoked on it! GSI: We read on your Kyle Dempster Solo Adventure Award profile that on this trip you will be surfing as a celebration after climbing each peak. 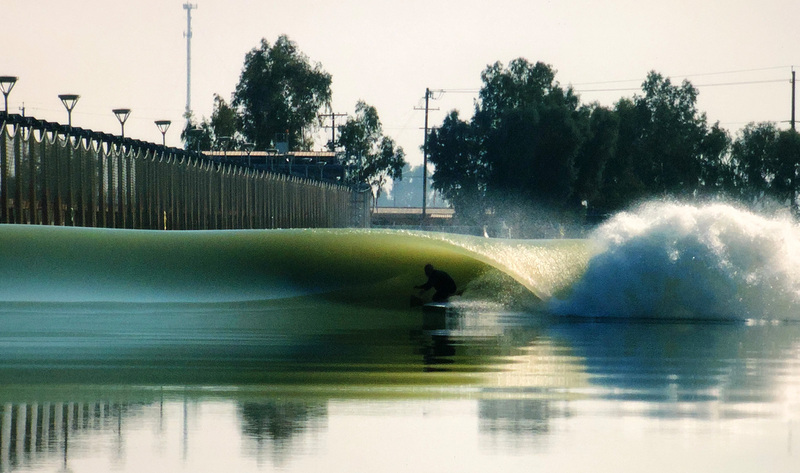 Our Mantra is Life is Better When you Surf - how does this resonate with you? AM: Not only is it a celebration, but a method of meditation and reflection. The act of surfing is so simple in theory and really has a way of putting me in a great headspace. I can leave the beach feeling refreshed, stoked for my next objective and also have something to look forward to when I’m shivering in the alpine! It also allows me to meet some of the coolest people on earth as surfers generally have such a positive outlook on life and adventure. Surfing really adds a necessary flavour onto an already epic trip. 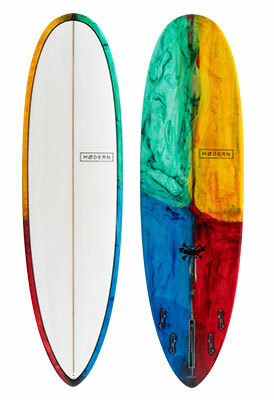 Anthony's board of choice for the trip is a Modern Love Child. The Love Child paddles exceptionally well, adapts easily in a variety of conditons and is sure to imporve your wave count.